Marathi Hindu peoples welcome a new year on Gudi padwa day, this day celebration done in Maharashtra on Chaitra month as per Hindu calendar. In Karnataka or Andhra Pradesh people love to celebrate this day as Ugadi. Gudi padwa in Hindu culture indicates the worship of the Lord Brahma and people trust the truth that Brahma is the creator of this universe. In the country of India this day celebration in different names and in different forms too. 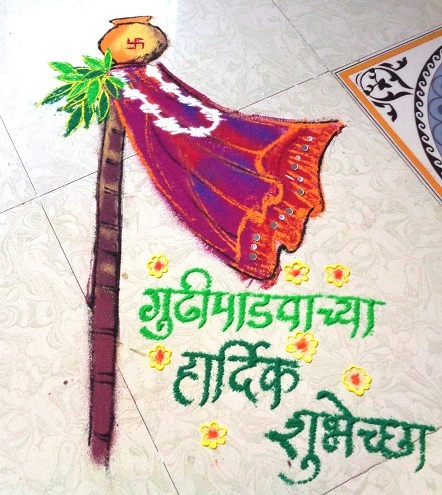 Women’s like to decorate their house with the help of Gudi padwa rangoli designs. 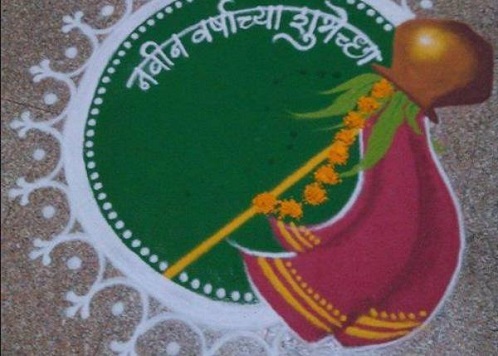 Gudi Padwa, follow the centuries-old tradition festival, choose your favourite colours, and try the top 9 these simple and easy Gudi padwa rangoli designs. Indian tradition never backs down, gudi padwa is the best season which gives the fresh day as a beginning of new Marathi year. Wishing quote in Marathi with this type of design gives a pensionable traditional look for the home entrance. Try this design sure for your upcoming Gudi padwa. 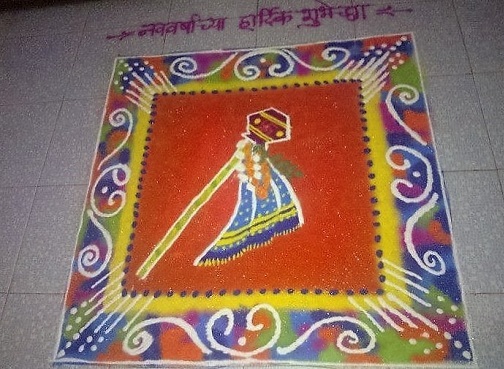 Simplicity is the best way to explore your idea, if you are looking at simple rangoli designs for gudi padwa then try this square simple gudi padva wishes rangoli for small space on the entrance. Middle placed symbol of gudi padwa can attract a catchy look for everyone. Decorate your main entrance with the design of simple gudi padwa rangoli on occasion; this padwa rangoli can give you the best look for your efforts. Quote in Marathi for gudi padwa wish can make a trendy statement. Green colored maintain softness touch for this design. Design in the white coloured circle with the help of orange-coloured circle and leafs can better creative rangoli for gudi padwa. 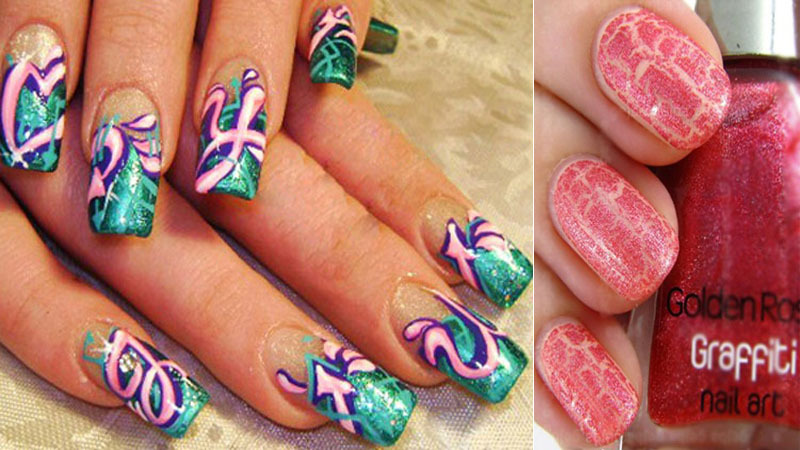 You can try this pattern using material like colored rice, flower petals or sand etc. you can try this rangoli near the entrance or main gate too. Special rangoli for gudi padwa can be done using as per your material need, you can mix colored as per your idea too. Circular lines and design can give a catchy effect on design. 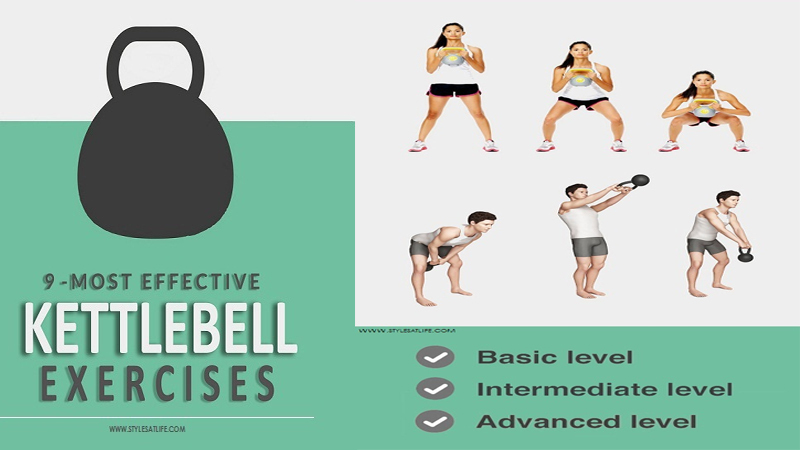 Put divas around the circle which effectively catch the positive effect of the natural theme. Green and orange colored will be the good choice in color for Gudi padwa special. 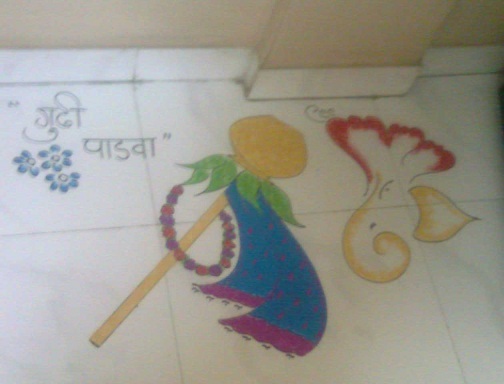 Mentioning tradition using your idea in rangoli can be effective sure. This design is very simple for small space. 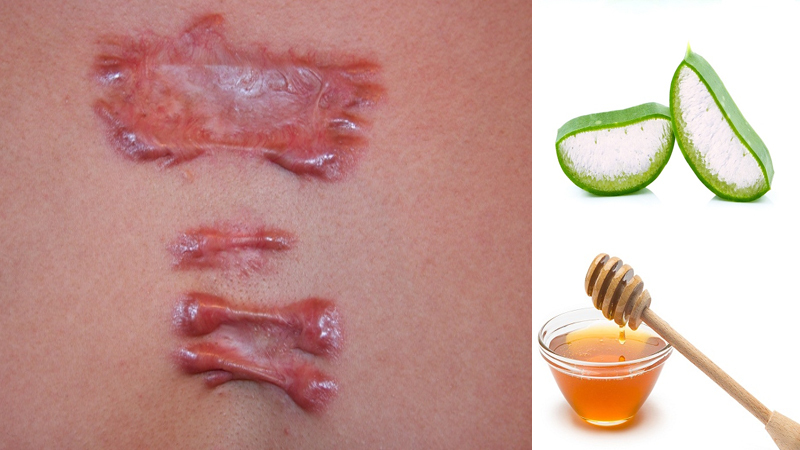 You can easily mention vibrant Saree, Kalash, and a Gudi. Try using more colour as per need. Put a small diva for a long day on Marathi New Year first day. 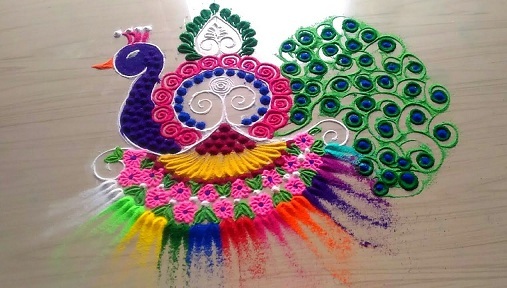 Peacock is the main symbol on any occasion, this type of peacock design very useful and attractive on occasional rangoli type. Such type of design mostly you will find in temples too. Different varieties and more colors can give a good and beautiful art at heart. 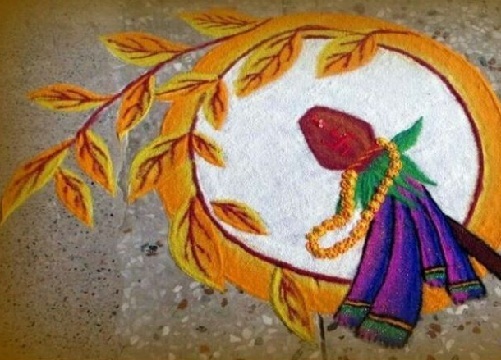 Women’s love to design a rangoli on any occasion and few experts like to use their hard efforts to make a classic and unbeatable rangoli on Gudi padwa. This is the best and tough design which is a portrait type of paithani saree wear women in Marathi culture. This design takes a little more time but experts can give a more emotional touch in this way on the season. 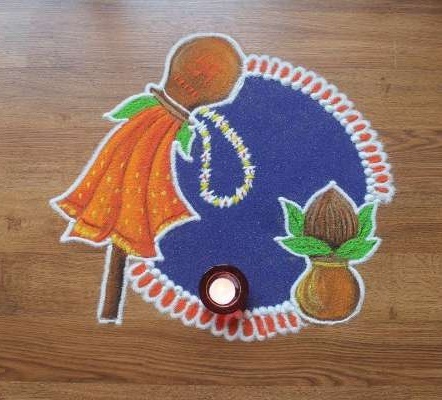 If you are thinking small rangoli on Gudi padva for your small space near the door then rangoli gudi padwa in small structure will be this one. You can focus on main gudi design only and make a small quote happy Gudi padwa in Marathi. Fewer amounts of color and material can be the best choice always in a simple way for expression. 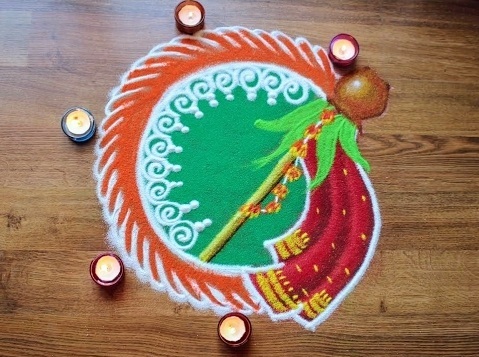 Try these different type of unique idea for your gudi padwa celebration in rangoli patterns. Rangoli gives a special touch on this day. 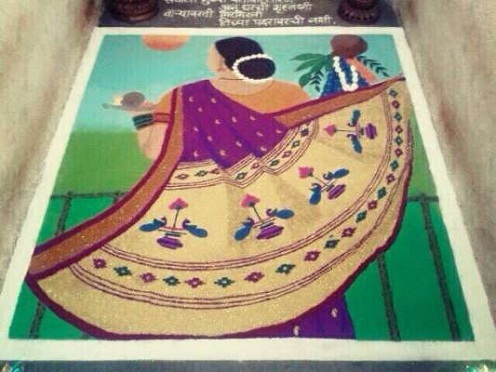 Marathi new year welcome tradition in rangoli format can be a good choice always. 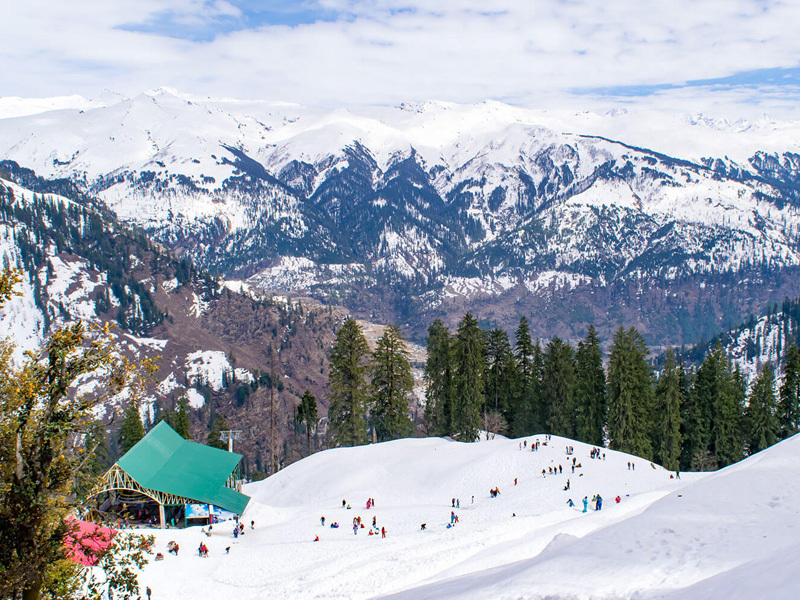 9 Best Honeymoon Places in India in February for the Perfect Getaway!